I’m so thrilled to have met the lovely George and Smee girls, they styled our event SO beautifully and just really nailed the brief from our Event Manager. People couldn’t stop complimenting the styling all day, they went beyond our expectations of what we thought possible with the space. We hope to work together again soon! I just wanted to say a massive thanks to you and your team for the beautiful job you did styling the Be Seen In Melbourne QMS event we produced. The space at Commune came up a treat and your efforts were well and truly on display! Its been a pleasure working with you over the past few weeks and we look forward to doing some more great work together in the near future. The incredibly talented duo transformed some very tricky, empty, large event spaces into magical and memorable wonderlands! George & Smee, work seamlessly to tight deadlines and challenging briefs. The girls must be born with it because they certainly don’t teach this flare nor sell it on the shelf. We received a flood of impressive feedback from senior clients and internal stakeholders which means George & Smee will be the first we call for our next event. Working with them was nothing short of an absolute delight. How can I thank you enough for doing such an amazing job of styling our wedding? You absolutely blew my mind – it was everything I had hoped for and so much more. I was overwhelmed by the glowing feedback from all the wedding guests, every area of the space looked stunning. You’re absolute magicians – even at ungodly hours of a the morning!! Thank you for your creativity, talent and ability to interpret my brief to exceed my expectations. Thanks again – you’re rock stars. Working with George & Smee is always a pleasure. Their ability to take a concept and bring it to life in a visual space is breathtaking and testament to the research and development they put into each and every project. They are a creative duo who have organized everything from simple styling to large scale event designs. With a unique range of props unavailable from most Sydney based companies the girls are a refreshing delight. Thank you so much for everything and being such a breeze to deal with. I just wanted to express in writing how delighted Paddy and I were with the styling on Saturday. Everyone commented on how beautiful the venue looked! Thank you so much for everything and being such a breeze to deal with. You certainly made that part of the wedding super easy and we were thrilled with the overall look, so thank you again! George & Smee assisted us in styling our wedding at Gunners Barracks in Sydney. I cannot begin to explain how amazing George & Smee were throughout the planning stage! From the numerous emails to constant changes to our quote they were extremely helpful and patient and when we had to change our plans at the last minute due to the massive Sydney Storms they were again there to assist us with ease! I highly recommend the girls! We had SUCH an incredible day. I'm only coming up for air now! But it was just magical. Everything looked SO magical. It felt very us. It felt amazing so thank you so much for everything! We just wanted to say a huge thank you for your beautiful work on Saturday. The ceremony looked absolutely gorgeous, it was even nicer than I had imagined. I loved the styling of the bar and the signing table under that big fig tree looked stunning. The bouquets were perfect! Exactly what I wanted. We received many compliments from our guests. We were highly recommended to contact and request styling from George & Smee by our venue coordinator during our wedding planning. I'm so glad we did! 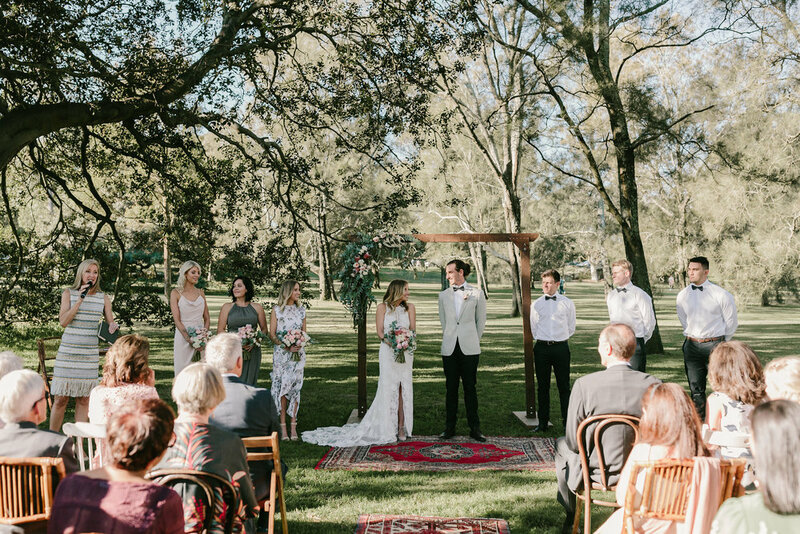 Georgina (George) and Yolandi were incredible and worked their absolute magic on the styling for our wedding ceremony and party event (beautiful native florals and layout styling). Correspondence was excellent with the team, with George constantly ensuring that all aspects of styling planning were to what I had specified, and even providing recommendations. George & Smee also provided the florals for my wedding bouquet, floral crown(s) and pins for the gents - and we received many compliments from our guests. Thank you George & Smee for working wonders for Anthony and I during our wedding! Keep up the amazing work! I just wanted to say thank you, thank you, thank you for a wonderfully themed night. Everyone was stoked with how it all looked and it just wouldn’t have been as good without your expertise and skillful execution. The client was drooling over the styling and guests loved it just as much! We will be in touch for future events – and across various other clients too. Brilliant work, and thank you again ladies. George & Smee came highly recommended to us by an event industry contact. George & Smee came highly recommended to us by an event industry contact. Working to a brief they were tasked with creating an event look and feel that reflected the client’s brand values. This included a number of bespoke installations that were executed in an extremely short period of time and to an exceptional standard. The event guests and just as importantly the client was extremely pleased with the outcome and we welcome the opportunity to work with George & Smee again.